Do you work for Mandrill? Learning about Mandrill? We can help. Mandrill as a platform has all the features I require of a transactional email service. My company has used Mandrill extensively for many promotions for several years now. It does the job well, until it doesn't. Customer Service. In my experience Mandrill only provides Tier 1 customer service, with no option to escalate to an engineering team if there is an issue that can't be resolved by CS. The CS reps in my experience only provide canned responses with links to their support pages, and claim they have no insights into the inner-workings of their platform. Recently, we were running a promotion for a Fortune 500 company, and our Mandrill capabilities just ceased to operate. The CS rep was able to assist us to get emails moving temporarily, but after we were able to move about 500 emails in a batch, the system ceased to operate. No matter how many times we pleaded to have a conversation with an engineer that could help us test, to determine where the issue lies, our requests were ignored (not even directly denied). We were forced to move our promotion off of Mandrill. If you are looking for any type of automated transactional email provider, look elsewhere. Mandrill will not help you if you encounter an issue, unless you are in their top tier of users by volume. We have had two incidents which required CS support, and were never resolved. Mandrill fully admitted they would not even investigate our one issue, and encouraged us to look elsewhere. It wasn't a matter of whether they could fix the problem or not, we just wanted to highlight the issue, and see if there were any possible workarounds. They did not want to have this conversation so they ended the support ticket. Transactional Email, sending and receiving emails to and from consumers to support CPG promotions. "No frills, marketing-friendly transactional emails"
Aside from a few hiccups (which I’m sure you could say for every company) Mandrill is a reliable and inexpensive solution for transactional emails. The biggest challenge is that it lacks analytics. You get all the basics - number of sends, opens, clicks - but anything further than that has to be done with another tool. Even if stats were better, emails stats only store for 30 days so we are constantly having to export to outside storage. Those two factors combined means a lot of heavy lifting that may be outside the expertise of an email marketer. It would also be nice if you could build emails with a front end email builder instead of relying solely on HTML. I think it’s done this way because it’s an extension of Mailchimp, not its own product. It will require people with IT experience and analytics experience for set up. It allows us to send emails triggered by actions taken on the website. Other than monitoring performance, it can be set it and forget it for companies lacking resources for a dedicated email marketing person. "Works so well I rarely think about it"
An easier way to remove unwanted domain verifications. I accidentally made a programming mistake at one point and it created nearly 100 domains in the list. The only way I see to remove them is one at a time. And once removed it always defaults back to the first page. The API is very powerful. Make sure you take the time to learn it well. Allows me to not have to manage my own mail server. Which in turn allows us to achieve PCI compliance because we can shut down all of the mail server ports on my server. "Great solution for Transaction emails in Magento"
Mandrill gets the job of transactional emails done easily and within a platform that is easy to use and monitor. The cost ($20/month) is also very reasonable and is included in my monthly Mailchimp payment. If you have two domains within a single Magento install, Mandrill can get confusing and send emails from the wrong domain email. Spam attacks limit hourly email send. There also appears to be an unresolved mix up between Mandrill and Mailchimp when it comes to our email subscriptions, but it is easily worked around. Please make sure you get your domain settings correct! Solved the problem of sending transactional emails without issue and has performed in the background without any oversight required. Love that! "Best and Simple solution for transactional email"
Mandrill is the best way for transactional email, very user-friendly interface, easy to use even for those who are not so much technically sound. Documentation is well explained, plugins and API's are great. Analytics is great to track customers activities on emails. All the predefined templates and templating structure are great and professional looking. Mandrill has a great set of API that works with the variety of platforms and software's, anyone can integrate with any setup but it works great with especially with mail chimp account. Mandrill provides clean and user-friendly dashboard and a very good search feature. Mandrill is only available as a part of mail chimp now. Mandrill service is no longer if you want to use it alone. Mandrill has removed it's free plan now, It's now required to have a paid monthly account with mail chimp. It's not a one-time fee or something, it's a monthly paid account. If you're a current MailChimp user and looking for low cost best solution for transactional emails then Mandrill is the perfect solution for you. I recommend users to spend some time on documentation part, the API is very simple to use., search features are great to track down trends and activities on your transactional emails. There are plenty of online tutorial videos and documentation available, so you can start running without any problem. Mandrill is a great and simple way to send transactional emails. It's very cheap in compare to other solutions for transactional emails. It has a very good set of analytics tool to track the customer activities over emails. Themes give a great and professional look to our emails. Mandrill helped our company replace an unreliable email server from our web hosting. We set up everything very quickly and our transactional emails started flowing very quickly without any failure. We can track down each single activity now from analytics tool of Mandrill. Mandrill provides an inexpensive transnational email platform. The platform provides a great oversight of delivery, reputation, times of sending, countries to which you have delivered to and what mailbox system they make use of. You can see the content of sent emails, you can't do this using the competitor Sendgrid. Mandrill now only works through Mailchimp which in my opinion is a movement in the wrong direction, you have to login to your Mailchimp subscription to access Mandrill. A Mailchimp subscription is now required, Sendgrid and Mandrill are close substitutes. Completing the full verification process is useful (SPF records etc), but be mindful of unintended consequences of setting up secure emails. All other services that send on behalf of your domain will also need to undergo this verification process or you will help to ensure those emails hit a users junk inbox. Cheap transitional emails and a quick and easy oversight of reputation. "Quick to integrate Transactional Email Platform but wait, there are better vendors out there"
Ease of use, Readily integrateable, API Documentations, and a simple HTML editor. Availability of metrics to track the transactional mails and what I feel is an unparlelled reliability in terms of the messages getting delivered to customers well in time. I dislike the fact that it has to be used only in conjunction with MailChimp which means you need to subscribe not only for Mandrill but also for MailChimp which is a loot if you do not desire to use the platform. The Dashboards and the reports could be displayed in a much more easy to understand format. This would assist users to consume the metrics much easily. As the Mandrill is integrateable with MailChimp, reports can be provided on MailChimp's dashboard as transactional and Promo Emails. This would provide a single unified view for both the metrics. Mandrill is one of the more reliable solutions in the marker and so costs more than other competition you may be considering. You could consider using SendGrid which is a much more inexpensive tool in case you would not be using MailChimp for your targeted mail campaigns as Mandrill is available only if you are using MailChimp and not available separately. "Very good, if not expensive, email isp"
Being able to use mailchimp templates means we not longer need to code and hold templates locally. Reviewing and resending emails is very easy to view and track. Using sub accounts is a nice way to handle unsubscribes. Webhooks for unsubscribes easy to handle. Not met any scalability issues at all. ISP reputation is very good, good display of reputation to us too. Automatic unsubscribe link is a little tricky in terms of balancing sub accounts. Linked to mailchimp account which was a problem when we were incorrectly reported for miss sending. (essentially brought down our site as all notifications go through mandrill). I think there could be a better way to allow designers to use templating language on mailchimp so that develops do not have to dig into the template code to add the merge tags manually. I've had problems with handle bars not working correctly too. We aren't able to use mandrill for our referral emails as these are not users who have signed up, but are emails addresses referred by our existing users. It can get pretty expensive compare to other email isp's, especially amazon ses. If you find templates a waste of time to develop, really easy to move them from mailchimp to mandrill and you never have to touch them appart from your designers! We use mandril for our transactional emails. "Instant emails sent without you even needing to worry"
Our services require emails to be sent to new users, as well as emails to be sent to us AND the user when they submit a new licensing project. I had no idea how to resolve this problem, but our web developers sure did. We've used Mandrill since the get-go, and we love that it's one facet of the business we no longer have to worry about. We just crossed over our transactional email limit for the first time this month. All of a sudden, we weren't receiving any submitted projects, and were getting calls left and right about our verification emails not being received. The good news? Our business had grown to the point that 2,000 monthly emails wasn't enough. The bad news? We have to start paying for the service. Blocks are available in a minimum of 25,000 emails. So we won't come close to touching that for quite some time. Be prepared to pay if you'll be sending a ton of emails! We don't have to worry about our users receiving emails from us when it comes to joining our app or submitting their projects or any project changes. If we had to do this manually, I don't think we'd ever be able to sleep. "Mandrill handles transactional emails with ease." Once set up, fairly intuitive. Easy to drop HTML coded emails into interface. Performs pretty much flawlessly and provides easy to use stats. It's also easy to find specific emails when someone claims "I never got it"! We have 100s of these, so tagging is essential to keep track, but sometimes the tagging simply does not work...it's in the email, but when you search no results! Also, there is basically zero support. Sometimes MailChimp can help with their support, but the last two emails I sent directly to Mandrill went unanswered. Better customer support. some more testing features. We use this for all our transactional emails and for our abandoned cart emails. We have kept up a high quality of customer service and have realized significant revenue from the abandoned cart emails. "Reliable for the price but could be better"
I love that we get to send at least 250,000 emails for a decent price with very reliable delivery rates. Dashboard is very easy to use & the API along with addons/integrations for Wordpress & contact forms make our lives easier. We dislike how emails are only stored for 30 days and development needs more work for addons and integrations. Try SendGrid or Mailgun first to see if they fit your needs before spending the money on Mandrill through Mailchimp. Mandrill lost its edge when they decided to make it an add-on for Mailchimp users. Now, if you want to use Mandrill for transactional email you have to signup for Mailchimp, which makes the cost of sending transactional email through Mandrill significantly more expensive. "Reliable and good value, but dated functionality - needs a refresh"
We're happy with Mandrill so far, it's scaled with us. Some limitations with technical fault-diagnosis, gnarly problems need active chasing. The pricing integration with Mailchimp has suddenly made the combined platform of marketing & transactional now unworkable. Extremely expensive to store contacts in Mailchimp at the scale that Mandrill is designed to serve. Fine for use as a dumb email push service, good value unless you have to add other 3rd party systems to enable any kind of marketing intelligence or CRM. "Easily Programmable Transactional Email "
"Simple transactional email with great MailChimp integration"
Mandrill provides an easy-to-use transactional email system with a robust API that works with a variety of platforms. It can integrate with pretty much any setup you have, but works especially well when paired with a MailChimp account. Mandrill features a clean and concise dashboard that gives you a great overview of your account status and a powerful search feature that makes it easy to track down issues that may arise. Mandrill was so easy to use and implement, even for someone not especially technical. Their API, documentation, and plugins are fantastic. I really can't recommend it enough if you need bulletproof transactional email at a very low cost. My only real complaint would be the lack of team support. As it stands, if you want multiple members of the same organization to log in, you must use a single account with a shared password. I wish Mandrill allowed you to grant access to team members using a similar method that MailChimp already does. This mild inconvenience is honestly the only thing I don't like about Mandrill, and with the service's upcoming deeper integration into MailChimp, it's likely to be remedied soon. Take advantage of the great search features to help track down trends in your transactional emails and find where processes are breaking down. Mandrill helped our organization replace a flaky and unreliable email server from our web host. It took only a few hours to get everything set up how we needed, and the transactional emails started flowing quickly and reliably with no failures. Before, trying to track down the source of receipt and notification failures was an absolute headache, but we have never once had a failure with Mandrill, and its reporting features actually helped us track down a larger problem with our web stack. "Mandrill makes Transactional emails a breeze"
Mandrill has been great for our company. <strike>It's low / no cost plan was exactly what we needed.</strike> If you don't want to be hassled with reputation management (believe me, that itself is a fulltime job...), then Mandrill with it's hosted transactional email is the way to go. EDIT: I dislike how they have removed the free plan. It is now required to have a paid monthly account with Mailchimp. Not just a paid account, but a paid monthly account. It would be nice to have longer history. The free plan has a limited history. Really all of my gripes would be solved with paying for the service, but we send less than the maximum 12,000 emails per month for the free service. I recommend that users spend some time in the Docs. The API is quite simple to use. Also, make sure you have your webhooks setup. The webhooks really make it simple to see what is going on with your implementation. <strike>We have been able to send out around 8,000 emails a month for free.</strike> It has taken the responsibility of reputation management off of my shoulders, which freed up many hours every week. We can use this time to better understand our customers. (Our business problem was sending out surveys to our existing customers). Mandrill makes it easy to work with the CAN SPAM act. I'm not worried about it because Mandrill has my back. "Great if you use MailChimp too." It's dead simple. Pricing is great. Their API is the easiest I've used although SendGrid is a close second. Their interface is likewise straightforward both for sending and also handling incoming email. It's the perfect solution if you're already using MailChimp their parent service. It's now only available as part of a MailChimp subscription. This is both a good and bad thing, good if you already use MailChimp but otherwise this service is no longer available as a separate solution. If the product or service you're building already uses MailChimp then Mandrill is perfect. But otherwise it's no longer even available as they have shuttered their standalone service. I've used Mandrill for 3-4 projects. For incoming email they also let you couple specific email addresses with webhooks. Other providers require a more complicated setup with subdomains rather than email addresses. For starting a new project they generously allow you to start with a free plan up until 12,000 emails a month. Email tracking (opens/clicks) for transactional emails is also one of the best. The interface is very informative and so far helped us a lot when we had to investigate issues with customers regarding sent emails. The fact that it keeps a detailed record of how many times an email was open is an almost indispensable when dealing with transactional emails. The automatic blacklisting/whitelisting feature hurt us pretty badly a couple of times. The web app is rather slow. And it lacks a "teams" feature, to allow multiple users to access data for the same organization (rather than sharing the same credentials among a team of people). I also wish it could retain for more time email contents for future inspection. Check your email volume to understand the pricing, even though the service is rather inexpensive. Also be sure your system/architecture clearly distinguish transactional vs non-transactional emails. Mandrill is a great tool but you might not want to use it for every email you need to send out from your system. We need to send out emails after users complete certain actions, and we need to make sure these emails get delivered. Mandrill helps us by solving for us all the problems related to reliable delivery and tracking of user interaction with the email. "A Solid Email Transaction Platform"
There are other services like Mandrill offering better options for startup companies that can't pay for a full service, Mandrill doesn't have the best pricing but I think the stability and experience that mandrill offers you make it a product that is worth buying. the free plan could be better and less limited. if you are a startup or individual developer and need some platform or API like this I think you'll be pleased to use it, but if you are using other like mailgun I'd probably say stay with it, there are no major differences and they're both good. We are using it as a transactional email platform, and until now it has been a good option without any major problems to solve, intuitive, simple and powerful tool, we can easily handle the emails without being experts in this topic, and mandrill's documentation is really helpful, you learn about it fast which is something I appreciate a lot, straightforward technologies. "Luckily we still use Mailchimp or we should have dropped Mandrill..."
Automated, triggered mails from our own solutions/apps are dead-simple with a solution like Mandrill's. I am told by our developer that the use of their API is good and their support great. The fact that Mandrill is now an add-on for Mailchimp rather than a standalone app is a possible bummer if we would not be using Mailchimp (which we are). We needed an easy to implement and reliable solution that could handle email sending from different triggers. Mandrill provided an easy to implement API solution with the same easy of use as their mother companies' main product Mailchimp. It works, it is reliable and it is affordable. "Awesome email tracking/marketing for transactional (1 to 1) messages"
That I can just configure them as an SMTP server and everything will happen automatically. For each email, I see when they opened it and with what software. I see which links they clicked and when and with what software. That they recently decided to merge mailchimp and mandrill. When I email one lead at a time with a customised message that includes links to demo websites, I need to know whether they actually checked them out. Sometimes people will just ask me for email information and then delete them. Mandrill is a good way to detect this, so I save my time and use it to help other leads discover a great product. It also helps understanding what time people read my emails, because this is also the best time to call them for a follow-up. "Transactional email from MailChimp, easy integration to WordPress"
You shouldn't be using your corporate email server to send transactional email. Why? Well, for one, it will bog down your corporate email faster than you can say Exchange if you have to send more than a few emails at once. If you're running an eCommerce site, every action a buyer takes on your sites can result in transactional email. Do you really want to have a bottleneck that's so easy to fix? Mandrill is, in my opinion, the best transactional email service available. From their WordPress plugin, which makes setup a breeze for WordPress and WooCommerce users, to their robust API that lets you integrate with anything you can send data to it with, there is absolutely no reason why you should still be relying on a corporate email server for transactional email. Oh, and if you already use MailChimp for marketing emails, you get additional transactional emails per month on a paid account! On free plans, there is a very strict limit on timed storage of sent mail. This can make it very hard to research an issue a customer has had with a previous email. However, this is a minor price to pay when you're on a free account. If it's a deal breaker, just move to a paid account! Just use it! There isn't a reason not to use a transactional email service! Transactional email should not be processed by the same mail server that handles your corporate email. By using Mandrill, we are able to endure large traffic spikes on our eCommerce sites. Everything about the Mandrill experience is top notch. From the admin interface, to the APIs, to the integration with Mailchimp, Mandrill provides everything a developer could need for dealing with transactional emails. The Mandrill API provides A LOT of functionality, however, all that functionality can be a bit overwhelming when trying to figure out simple tasks - such as just sending out an email. Many times, while searching through the documentation, it's not very clear what some of the parameters do or why they are even necessary and the documentation does not make it very clear. Just do it. Although there are plenty other transactional email services out there, Mandrill seems to be one driving the innovation. Additionally, if you need to manage email templates, you can't go wrong with the Mailchimp integration. I'm using Mandrill to handle ALL email functionality for my sites. This means I no longer have to manage my any email services on my own. Also, with Mailchimp's template integration, I can easily design my email templates and just feed in the necessary data with an API call from my site. Everything about Mailchimp makes my job managing websites easier. "Seeking an Alternative After Using Mandrill for Years"
It was straight-forward to link to my WordPress site and it's easy to monitor emails that are being sent from my site. Support is very limited and slow to respond and they've had some recent technical issues. I wanted a reliable way to send and monitor sending of emails that are sent from my WordPress-based site. For the most part it has worked reliably, but recently I've begun to question the future of this service. Since we used MailChimp and were very happy with the service, we decided to use Mandrill as well (from creators of MailChimp). The thing we love is that we can focus on our business. It's very reliable and we have not experience any outages or such things which is a key ability to have when dealing with e-commerce. Mandrill has a convenient servers structure and your customers receive their email almost instantly after you send it. The fact that we can use multiple domains for our account is very helpful (who would want to use more accounts?). Even their support is really a world class. They helped us to deal with the problem we had very quickly, efficiently and in a professional manner. Overall a 10/10 service from our point of view. I rarely dislike something about a service and there really is nothing to dislike about Mandrill (nothing that I know of). If you guys deal with e-commerance and need to send many emails, this is the right service to use. You will definitely not be disappointed. We're sending thousands of emails to our customers and when you're dealing with numbers like these, it is very important to do it cleverly. We have realised many benefits for example seeing our sellings in a real time. That's one of the features I personally love the most. Ingeniero Especialista SIG CAD en INTEGRAL, S.A.
An easy-to-configure email server, Mandrill is a transitional mail add-on from MailChimp. It offers an API, decent reports and storage of tracking data. We use it to send transitional mails and to be able to configure the emails. I typically use this software to check email delivery. This product gives our team a since of security that we can check that our customers are receiving the emails that we send them. As a support team, this is very important for us. I can't even tell you how many times a customer will say that they aren't receiving out emails. We check Mandrill and low and behold they are being delivered. We then have the client check their spam and find that's usually where it ended up. Mandrill gives our team reassurance that our email delivery system is on point and consistent. Not really much to dislike here. Mandrill serves its purpose and does it well. There have been a few circumstances where I'm sure that an email wasn't delivered to a customer and Mandrill said that it was. There really isn't a way to verify this, as Mandrill is what we use to verify these things. Mandrill will help you sleep at night, knowing your customers are getting your emails. I highly recommend this product for those wanting to make sure their work isn't in vain. "An easy to use email distribution platform"
You can start using Mandrill for free. 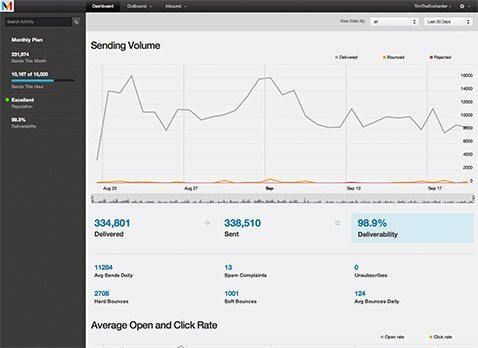 It has a very nice dashboard that will show you some basic statistics of usage, you have custom reports, you can check what has been sent and when and the best thing, is you are a software developer, you will love the available libraries like the PHP one that will let you send custom emails with templated hosted by Mandrill. I have to be honest, there's nothing I don't like from this platform. I have use it for years and never failed me. The only thing that I didn't like that much at some point was the PHP API, it can be hard to find proper documentation regarding how to use it to send templates with custom tags, and well, the verbosity of the code some developers don't like it but once you get used to, you will see how powerful is this tool. If you are a software developer and do a lot of web development that involves sending emails or if you work in the advertising area and need to send emails that you have to customize with html and even track, this is a very good option for you. Mostly every web project that has a contact form I have used Mandrill to send the emails with a PHP backend with several frameworks. I have also used it in the past while working for ad agencies to massively send thousands of emails to big email lists. "Great way to send transactional email"
- Mandrill is a drop-dead simple way to handle transactional email. - It has a great set of analytics to track what your customers are doing with the emails they receive. - The templates and templating system are amazing for making even the most mundane password reset emails look professional and to be on point with your brand. If you are an existing MailChimp user then making use of Mandrill for transactional emails should be a no-brainier. However, if you aren't currently a MailChimp user then Mandrill may no longer be the right solution. Mandrill is an excellent way to send transactional emails from our websites and applications. It gives us a wide range of analytics to track the usefulness of emails. The theming gives our transactional emails a great look. It is very easy to use for a person that doesn't have the knowledge in coding. Especially if you are not so into digital platforms. Limited options on templates, I wish I could have more predetermined options to build from. So far so good, maybe add more basic templates and enable the ability to embed videos on the actual email template would be awesome! At our company, we can reach out to our prospects as well as keep in touch with our current clients. "Excellent on-demand tool for transactional email deliverability." we were able to get started with using the platform very quickly and we were able to integrate with their system within a day, excellent reporting and deliverability for our transactional emails have been great as well. we have planned rolling this out for our additional business units as well. Might be helpful if there are better training modules for how to best utilize all the features available in the platform. Go for it if you have trouble with getting transactional emails delivered. we were having a lot of email delivery issues which prompted us to take a look at Mandrill. We have seen about 99.9% delivery of the emails which was very problematic in the past. "A user-friendly way to manage transactional emails"
Mandrill's best feature is the support that comes with it. MailChimp (the company that runs Mandrill) has always been there to provide support quickly and reliably. Mandrill's documentation is also extremely straightforward, which makes it fairly simple to get started on your own. For those who already use MailChimp, Mandrill adds an unnecessary component to your email stack. Luckily, Mandrill is in the process of merging directly into MailChimp, so this shouldn't be a problem in the coming months. Since Mandrill is becoming part of MailChimp's core service, it would be wise to directly sign up for MailChimp and simply utilize the Mandrill add-on. Do keep in mind that transactional emails differ from "standard" emails, and the data you receive may be overwhelming at first. There are plenty of tutorials and documentation, both online and on Mandrill/MailChimp's own website, so getting up-and-running shouldn't be as daunting as it may seem. Mandrill has made it simple to create and manage our transactional emails. Email is not the core of the business I work in, so being able to quickly have it taken care of for me lets me focus on what I do best. "Decent, simple solution for transactional email"
I previously used Mandrill due to it's easy integration via the Heroku plugin and enjoyed its ease of use, API, and staying within the Mailchimp platform... They've since integrated Mandrill with Mailchimp even further so you now have consolidated billing, which is something that annoyed me. Mandrill is (or was when I used it from 2013-2015) pretty bare bones. It was also a total pain to try to create email templates using the GUI interface in Mailchimp (which I love) and then share those over into your transactional email. It's been about a year since I used Mandrill though and I'm told they've more tightly integrated with Mailchimp, so hopefully they've worked on that. Check it out if you're on Heroku and need a simple and easy to use, basic transactional email service provider. Mandrill is a decent, bare bones, simple solution for sending transactional email. We used it for all of our transactional email for 2 years and never had any issues with deliverability or availability. "Mandrill - A Quality Product, A Quality Solution "
Mandrill serves a very unique service. We've yet to find a solution that offers the same features in a easy to use format. that is only aware of what is taking place at a high level Mandrill does a really good job visualizing performance. be connected to the same account. It does well. However, there are some additional feature sets that are not as easily identifiable as others. For instance, we had one client request that all of the emails be sent once a week, as opposed to one by one from the activations. I would think this would be a relatively simple change / adjustment to the system. It actually required significant re-tooling of the way it was initially set-up. Explore different ways of setting up the projects. After a plan has been implemented, we've found it difficult to change. We use Mandrill to distribute emails from marketing solutions. These are generally from live events. Experiential marketing pop-ups and their social component counterparts. Mandrill brings transactional email functionality to an already great platform in its pairing with MailChimp. We use Mandrill for Cart Recovery, Browse Abandonment, and other triggered sends. It is a fairly basic transactional system and has limited functionality for complex merge field functionality. If you need transactional functionality paired with MailChimp, this is the perfect platform for you. We partner with several clients who use MailChimp and in order for them to take advantage of the transactional/triggered side of our software, they must be able to send transactional emails, which is only possible through Mandrill. I've used Mandrill to send transactional emails for a small side project of mine. It is great to see which mails bounced for how many people or how many of the people even clicked to read it. "Useful for marketing Email management"
Great tool to create targeted email campaigns. Automating emails is much easier. We now have an automated welcome email and automated message notification emails. I can't speak to the results that using Mandrill has provided because we have only recently started using it. "Easy to use, lightweight, bugfree"
Easy interface, Bug Free, easy reporting. Manages emails much better than native solutions and yet lightweight. Not much. Better search functionality perhaps. Automatic sending of emails. Makes it much easier to manage. "Your SMTP at your hand"
An email system that serves our transactional email needs well. Writing to their API has been painless with never a sense of anything missing. Typically we do about 10,000 messages a day. At this rate they're a perfect fit. Like all services of this nature we'd always like it to be faster. There are rare cases where we find ourselves waiting for messages to be sent minutes after the request has been sent. They do have a great admin UI that makes checking on the status of messages easy. If only it could always be near real time. As a staple of any business, email is an important but perhaps not glamerious technology. Mandrill does a great job of providing the necessary tools to add email functionality to any system. They take care of the "dirty" details that are mostly considered mundane but most are not sure how to deal with. All of our applications on many different platforms have email messaging needs. Mandrill has be a great service we added to our larger micro-service based system. "Excellent Bulk-Email Service for Businesses"
Excellently-priced service for bulk and automated emails for my mobile-app businesses. The tracking is excellent - and integrates well with our technology stack. The transitioning to Mailchimp is quite confusing! Before committing to Mandrill, make sure you're clear on how the service will work post the merge with Mailchimp. Automated emails to customers based on the customers' actions within our mobile-app. We now have a clearly defined set of templates for all customer actions and have never had any concerns with it.